The children of the Copper Tree Class, together with travelling children, Skye and Amber, rally round to cheer up Hana when they find out her parents have split up. Displacement, blame and self worth are fundamental issues contained within a story which, above all, helps readers understand a child’s rights to be heard. This book represents a celebration of a child’s right to be heard and for explanations to be tailored to meet their needs. 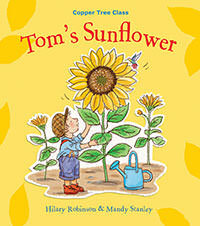 Written in simple language with a gentle nuance of humour and love, Tom's Sunflower is a teeny triumph.